U.S. General Omar Bradley famously commented that amateurs argue tactics, while professionals study logistics. Here are some suggestions for the logistics for your trip to Normandy. It's really quite easy to get to Normandy and find your way around if you do some advance planning. The most obvious destination airport for getting to Normandy would be Paris. However, it can be relatively expensive to fly to Paris. Other possible destination airports include Brussels, Amsterdam, and London. London can be significantly cheaper than the rest. You then can get from London to Paris or Brussels very cheaply by air or bus. From London it can be cheaper to go to a continental capital than to go to another city in the UK! Sources for cheaper air tickets to Europe include obvious brokers like Expedia, Travelocity, Hotwire, and Priceline. Also try these without big-budget TV ad campaigns: cheaptickets.com, cheapflights.com, kayak.com, and travelzoo.com. If you found a cheap flight to London, you might then go the rest of the way by connecting to a cheap flight on easyJet or another European budget carrier you find through whichbudget.com or flybe.com. Check Eurolines for cheap, fast, and frequent international bus connections. From Britain, some take the Chunnel and others cross by ferry. You might find that a return flight from your home to London plus a return Eurostar train to either Brussels or Paris is significantly less than a return flight to that city. The rest of the world (where you will be buying some of your tickets!) calls them "return" tickets. In the U.S. they're called "round-trip". 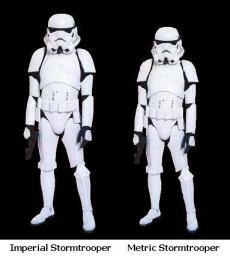 Be aware of the different terms! The SNCF site can provide information about schedules and prices within France. Note that many European national train lines like Deutsche Bahn can give you information about schedules and prices throughout western Europe. Freedom to roam! 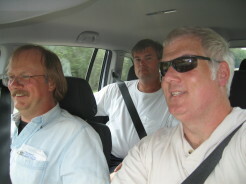 L-R: Me, Tim, & Jeff. You will really want your own car to see the World War II sites. It is possible to see a little by taking a train to Bayeux and going on a day trip, but it will be very limited and rather frustrating. There's one more possible inconvenience caused by the U.S. being a little behind the rest of the world in some ways: Almost all countries' banks now issue credit cards that are smart cards, with electrical contacts and an embedded chip. It's a very nice security feature, you must use a PIN to use the card and so a stolen card simply cannot be used. All Australian credit cards have been smart cards since 1985. The problem is that old-fashioned American credit cards don't work in a lot of the automated kiosks. For example, the handy system that sells tickets in French train stations. We have to go stand in line with all the other Americans at the staffed ticket window where we can still use our quaint no-security cards. Update — In 2014 the payment card companies announced that America would be catching up to the rest of the world some time in the following two years. In 2018 that was underway, most new credit cards issued in the U.S. included chips. You will want some fine-scale maps for navigating the roads. 1:100,000 scale will show all the locations and almost all of the roads mentioned on these pages, although not all will be labeled. 1:50,000 maps will make things easier. 1:25,000 maps will label everything mentioned on these pages, and even smaller individual buildings and walls and fence rows will be shown. Michelin 1:150,000 maps, the Départements series, are the ones with the yellow outer jackets. They're good maps for many uses and widely available, but they will omit some of the smaller roads we used. You can probably find them for the local region in bookshops in medium-sized towns. Shops in larger towns will also carry maps for more distant areas. Département map #303 covers all of Normandy. 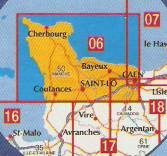 Index of IGN 1:25,000 map coverage showing Carte de Randonneé 1311E (Utah Beach), highlighted, and also 14120T and 15120T (Omaha Beach). Index of IGN 1:100,000 map coverage showing Carte de Promenade #06, Normandy. That 1:100,000 map included all the D-Day landing beaches. The only D-Day site we visited that it didn't cover was Pegasus Bridge, just a few kilometers off its eastern edge. 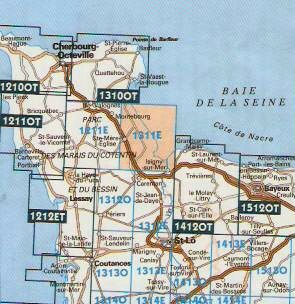 You would need both Carte de Randonneé #14120T and #15120T to cover Omaha Beach at the 1:25,000 that shows buildings and fencerows. The IGN maps may be a little harder to find (and more expensive) than the Michelin maps, which are sold in many book stores and gas stations. If you are passing through London on your way there, you can buy them at Stanford's at 12-14 Long Acre, Covent Garden, London, WC2E 9LP, between the Leicester Square and Covent Garden Tube stations. +44-(0)20-7836-1321. You might also be able to get them on order through your local book store using the ISBN number. And, some are available through Amazon. 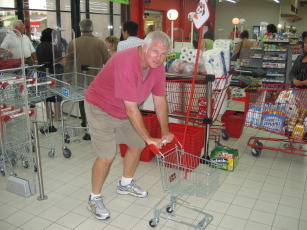 When shopping for food in le Hypermarché, you may find that the shopping carts are somewhat smaller than what you are accustomed to at home. I have been very surprised by the number of people who were amazed that we simply drove to Sainte-Mère-Église and looked for a place to stay. This isn't like going to central Africa, it's France, there are plenty of places to stay. Showing up without a reservation during high season would be a bad idea, worse yet in early June, but we were there in September. Meals, of course, were even easier to find. As I said, this is France. You won't go hungry. The only time we had any trouble involved some late-night searching around Luxembourg City. We did have a room reserved in Brussels for the last night of the trip, but that was the only advance reservation we made. In high season they're a B&B and rent apartments, in September they were happy to rent us more apartment than we needed for a very reasonable price. Bastogne — Some place right on the main square, we got a triple room for 105€.